For safe operation and license renewal purposes, nuclear power plants require direct inspection of underground and buried piping with accurate, reliable NDE technologies. Diakont provides comprehensive buried pipe inspection services, from pre-inspection analysis through final integrity reporting and repair recommendations. Utilizing a fleet of robotic in-line inspection tools equipped with multiple NDE sensors, Diakont’s inspection teams examine 100% of the piping system, precisely detecting and measuring corrosion, remaining wall thickness, dents, cracking, and more. Through early discovery of pipe defects and preventative maintenance, Diakont pipe inspection can prevent forced or extended outages, costly leaks, environmental damage, and regulatory scrutiny. Diakont’s compact, self-propelled crawlers eliminate the need for excavation and excel in piping conditions previously considered inaccessible, such as those under structures, or with vertical sections, diameter changes, or multiple elbows. Conveniently self-propelled and bidirectional, Diakont’s crawlers can be launched and retrieved from a single access point to inspect up to 1800 feet of pipe. entire inspection process, and meet or exceed your schedule requirements. Following each inspection, Diakont delivers a complete piping features list, including absolute thickness measurements, weld locations, weld defects, pipewall anomalies, and information about all fittings. Partnering with Diakont will ensure that your integrity management program gets the most value from its inspection budget. 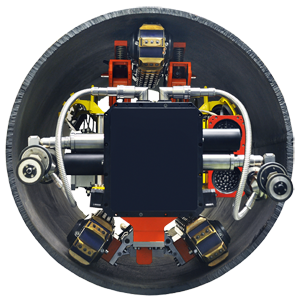 Diakont’s fleet of ILI robots is equipped with multiple NDE sensors to assess pipe integrity and provide real-time data analysis. Combining technologies in a single run improves identification of anomalies and eliminates the need for separate, costly inspections. Contact Diakont today to discuss your plant piping inspection needs.